I did find two women, Nora Dowd Finnerty, and Catherine Dowd Mulroy. The Dowd women were married in 1891 and 1892. Thomas and Bridget were married in 1889. My theory is that they were Thomas sisters. After their marriage the three families lived on the same street. But, I have no documented proof. Thomas sponsored Thomas Mulroy in his Naturalization process. They were sponsors for each others Baptisms. I have been searching for death information, but did not find anything in the cemeteries where my great grandparents were buried. The record keeping is not very good, and information is missing. The family lore is that there was one relative that lived in NJ and one brother Michael Dowd who lived in either Cleveland or Chicago. I have to get searching again and think I will start with the Church records, and go back to the cemetery. Naming pattern of Thomas and Bridget. I have been on vacation for one week and have not posted. I have been thinking a lot about my latest development. The date of birth and names of my great grandparents. This would not be such a mystery if I had erroneously just taken for granted other peoples information. I did not do that. When I took the dates of birth that were given on Thomas and Bridget marriage license I truly believed that they would know what they were. They were both literate......but, the dates of births and names of my great grandparents are totally different. With the exception of Thomas Naughton. I know that on the census records there were a few different dates for years of birth, but I know how that can be done. I will just have to revisit that. Who are these other people that I have have information from the dates provided on the marriage license application? Now that I am home I can scan and send them to my cousins and ask for their inputs. I will solve this mystery. Am I up to 20 questions yet? That is what I feel that I am working on, Playing Twenty Questions. The death certificates have arrived and I have more questions than I do answers. I did find the names of my Great Great Grandparents. They would be the grandparents of Anna Maria Johanna Bartels. I was correct in the assumption that the sisters of Alwine Bartels Dietrich and Emma Bartels Schwab would have given the answer. My great grandfathers name was Wilhelm Bartels and my great grandmothers name was Johanna Bertian (Bertham) both from Hannover Germany. In my research I found that my grandmothers brother was Wilhelm and a brother of the four Aunts was Wilhelm Bartels, he was also living in Duquesne, PA. They are now ensconced in my tree. I found that Katharina Rauscher Sperl Nosseck was Frank Rauscher also from Rosshaupt. This time it was listed as Germany, not Bohemia or Austria. Her mothers names was unknown. Katharina’s second husband Joseph Nosseck died at age of fifty four from TB. This was in 23 December 1916. The biggest mystery are my great grandparents Thomas A Dowd and Bridget Naughton. On Thomas marriage license application he had listed his birthday as 14 March 1860. I found a corresponding record submitted by a LDS member and on the Mayo IGFH site with that birthday and his parents listed as Thomas Dowd and Cate Sweeney. On the death certificate his birth is listed (by Bridget) as 12 May 1858 in County Galway…….and his parents listed as John Dowd and Catherine Fitzmorris. On Bridget’s marriage application she had listed her birth as 25 March 1868 and on her death certificate it is listed as 22 February 1865, This information was given by her son Richard Dowd. On the LDS site and the IGFH it lists her birthday as the March date and her father as Thomas Naughton and mother as Catherine Ward. On the death certificate her parents are Thomas Naughton and Nora Nee. This leaves me confused and with more questions than answers. For the moment I am stumped. On Monday Chuck and I drove to New Castle PA. I ordered the death certificates, and they said that I could not pick them up they would have to be mailed. I did not check the website to see if it was true. I did not want to be irked by myself. All I can say is it got there fast to the Bureau of Vital Statistics. She said it would take a few days and I know they will come on Saturday, which is the day I leave to go to visit my friend Ruth. I am searching for the parents of my great grandfather Daniel Zacharias Bartels. I had posted before that last year I had found his sisters buried in the McKeesport-Versailles Cemetery. I did not know they were here in the USA, let alone buried here. My mother had talked about her Tante Alwine and some other old German women. I suppose like everyone else as a child, they did not pay any attention. Or maybe she thought this was common knowledge. So, I am hoping that when the first and second sister died, the other siblings had given their parents name. Or perhaps it is wishful thinking. I remember that my mother talked about my grandmother, Anna Bartels Schridde had a cousin Margaret. I knew Margaret because she was a RN and was excited when I went to Nursing School. I guess the fact that Margaret had a mother and father did not enter into the equation since I knew Margaret as an adult. My father also told us we had NO RELATIVES and I have found plenty. We just never knew them, although he knew them. He spoke fondly of his Aunts and I remember meeting my grandfathers sister Theresa. So, I hope the certificates come on Friday, but if they don’t I will have something to look forward to when I return from my long drive south. I guess I am incorporating two ideas for this post. 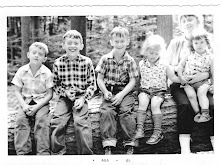 Saturday Night Genealogical Fun and Sentimental Sunday. My fathers mother, Gertrude O’Rourke Dowd had a lot of food allergies, but she ate what she was allergic to and then would take her allergy medication. Why? Because I like them. Later on my father, Thomas Dowd, would complain about various maladies but he would not go to the doctor or if he did he would be noncompliant. Tom said “Don’t you dare.” I didn’t….. I like the photo of my parents. It reminds me of AMERICAN GOTHIC by Grant Wood. On Monday I hope to take a road trip to New Castle PA to the Pennsylvania Department of Vital Statistic. That is where the deaths and birth since 1908 are located. I have a list of several I would like to have. Last year I found, and it was quite a surprise, four of my great grandfather siblings had emigrated to the USA around the time of 1890-1906. I want to request their death certificates and see if their parents are listed. I decided to go for the earliest one first because there were remaining sisters and, hopefully, they will have listed my great great grandparents. It is only about an hour drive and perhaps I can get myself in gear to get things done. This is a picture of my parents and brother Tom and I. It was taken in our back yard. I am thinking it was the summer of 1951. Because my brother was born in November of 1950. My thoughts now are, who took the picture and why are we both looking at my dad. He must have said something funny or crazy to get us to look at him like that. My father always planted a large garden. He told me that his grandfather, also Thomas Dowd, always had a large garden and he would walk to his house and he would give him vegetables to take home. Dad had two plots, upper and lower. In the lower he would plant tomatoes, green onions, beets, cabbage, lettuce, and beans. In the upper garden he had asparagus and raspberry bushes, and at the property line a line of Concord grapes growing on a wire fence. He also planted peach, apple and plum trees. The apples were made into apples sauce and plums were canned. The peaches did not seem to grow well, or there were not enough for canning. They canned everything they grew. Mom and dad would spent a lot of time in the late summer and early fall in a sweltering kitchen preparing the vegetables, cleaning the bottles, and washing the rings for the Ball Jars. In early fall we would go to a Farmers Market and buy a bushel or two of peaches, apples, pears and more tomatoes. I had the honor and privilege of working in the kitchen. I hated every minute of the drudgery. I remember blanching tomatoes and peaches and taking off the skins in preparation for putting them in jars. A sugar syrup solution was made and put over the fruit. I guess boiling water was used for the vegetables. They would cook them in a large water bath or in a huge pressure cooker. They knew which had to be sterilized in what cooker. After that was done for the day I would hear the lids of the jars popping as they permanently sealed. We would have produce all autumn, winter and spring. Then in the summer the process would begin again. After my father died, I found homes for all that equipment. I think my friends really like what I gave them. I do not do any canning myself, but my sisters do. I guess it is because I was exhausting from canning at an early age.